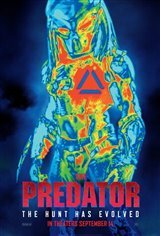 A sequel to the 1987 sci-fi hit Predator, in which a team on a mission in a Central American jungle find themselves relentlessly hunted by a terrifying extraterrestrial warrior. In the sequel, a young boy named Rory McKenna (Jacob Tremblay) plays with the wrong “toys” and accidentally summons the deadly Predators to his small town. Rory’s father, Quinn McKenna (Boyd Holbrook), puts together a team of ex-soldiers to protect the human race from these threats to mankind.